All transactions are safe and secure with a reliable history in online purchasing behind each of our associates. Buy the Jack Sparrow Rum t-shirt to own Pirates of the Caribbean clothing and merchandise. This tee will have everyone enviously asking, "When did you go to the Black Pearl Distilleries?" 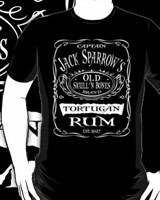 Available on multiple colors, the front of the T features a logo for Captain Jack Sparrow's Tortugan Rum. Now you can own one of these rare Pirates of the Caribbean t-shirts that are great for adult fans of the movie. The design reveals that the Captain's rum is part of the old Skull and Bones brand, which was established in 1697. In addition to the Jack Sparrow Rum tee above, browse the Pirates of the Caribbean Clothing Gallery for more apparel like men's and women's clothes, kids shirts or hoodies.